Injury to the articular cartilage of the knee is common, particularly in the athletic population. The frequency of full-thickness articular cartilage injury is only expected to increase as participation in both high-level and recreational athletics continues to rise. Articular cartilage has limited potential to heal, and defects left untreated often result in continued pain, limited mobility, and progressive degenerative changes. Although a variety of surgical treatment options are available, a variety of factors – including lesion size, location, degree of bone loss, and presence of multiple lesions – play an important role in formulating the optimal treatment plan for these injuries. One surgical treatment option aimed at restoring articular cartilage is autologous chondrocyte implantation (ACI). First discussed in an article published by Brittberg in 1994,  ACI is a 2-stage process indicated primarily for full-thickness cartilage lesions ranging from 2cm2 to 10cm2 with minimal underlying bone loss. Although frequently utilized for a variety of defects throughout the knee, it is not currently approved by the US Food and Drug Administration (FDA) for treatment of articular cartilage defects of the patella. The following case example illustrates a typical presentation for a patient with an articular cartilage injury of the knee. The surgical technique of ACI for the treatment of this disorder will be outlined. A 25-year-old male who had previously played college football presents with a history of left knee pain and swelling over the last 8 months. He currently plays recreational football, but denies any recent trauma. He noted pain and swelling in the knee after a weekend football game several months ago. He denies any sense of instability. The pain is centered around the patellofemoral joint; the patient has no pain on the lateral side of the knee. Occasionally he will experience catching and clicking in his left knee, but no true locking. The patient has no symptoms in his right knee and has never had any problems with or injuries of his right knee in the past. Anti-inflammatory medications provided minimal pain relief but did not reduce the swelling in his knee. A cortisone injection in the knee provided relief for 3 to 4 weeks and then the pain and swelling returned. Figure 1. 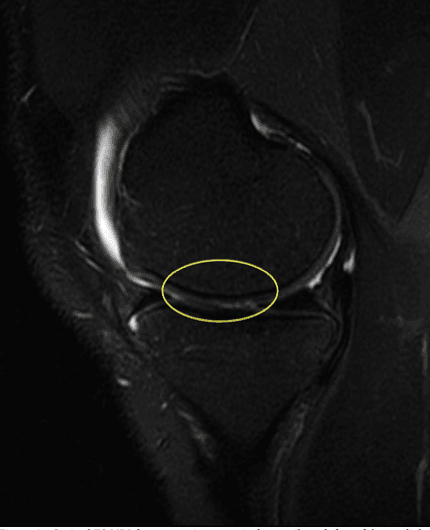 Sagittal T2 MRI demonstrating an articular cartilage defect of the medial femoral condyle (yellow circle). Figure 2. 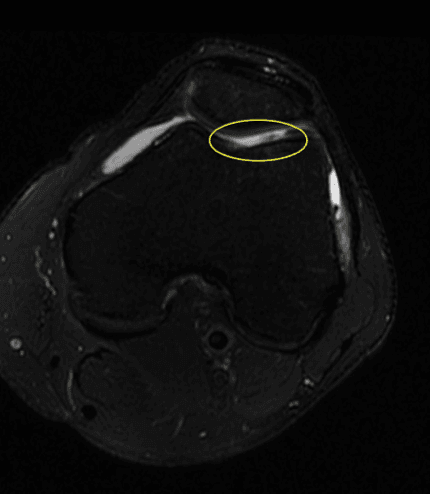 Axial T2 MRI image demonstrating an articular cartilage defect of the femoral trochlea (yellow circle). After discussion of the risks and benefits of further conservative care verus surgical repair, the patient underwent a right knee diagnostic arthroscopy to better define the size and characteristics of the articular lesions. A large (2.5 x 3 cm) full-thickness articular cartilage defect of the medial femoral condyle was encountered (Figure 3), as well as a 2 x 2 cm lesion on the femoral trochlea (Figure 4). Figure 3. Arthroscopic demonstration of the same articular cartilage defect of the medial femoral condyle as outlined by the arthroscopic probe. Figure 4. Articular cartilage defect of the femoral trochlea at the time of arthroscopic cartilage biopsy and harvest. The remainder of the knee, including both menisci, appeared normal. After arthroscopic evaluation, it was determined that the patient should undergo a 2-stage autologous chondrocyte implantation procedure. Following diagnostic arthroscopy and defect evaluation, chondrocyte harvest can be undertaken. Biopsy 2 large, “tic-tac”-sized, full-thickness samples (5 x 8 mm) from an area of minimal weight-bearing articular cartilage, usually the intercondylar notch. Harvest approximately 200 to 300 mg of chondrocytes and send them to the lab to be cultured and processed in preparation for reimplantation. During the second, implantation stage, make a mini-arthrotomy, taking care to protect the native articular cartilage and meniscus. After exposure, prepare the defect to a stable vertical rim (Figures 5-6). Size the defect with a ruler and outline it using sterile glove paper. Use this tracing as a template to create a correctly sized collagen membrane patch to cover the defect. Use of a collagen patch (Biogide; Geistlich, Germany) currently represents an FDA off-label use. Cut this patch to size using the previously made template and then allow the patch to soak in a vial of harvested cartilage cells, mimicking “3rd generation” ACI technique. Then sew this collagen membrane over the defect using 6-0 vicryl suture (Ethicon; Edison, New Jersey). Ensure a watertight seal with a saline injection trial: Use a sterile angiocath to introduce a small amount of sterile saline underneath the patch. Reinforce any leaks with additional suture. Removed the saline from the defect and inject the chondrocytes underneath the patch. Use the 6-0 vicryl suture to sew shut the injection site underneath the patch and then reinforce the entire patch with fibrin glue around the periphery (Figures 7-8). Figure 5. 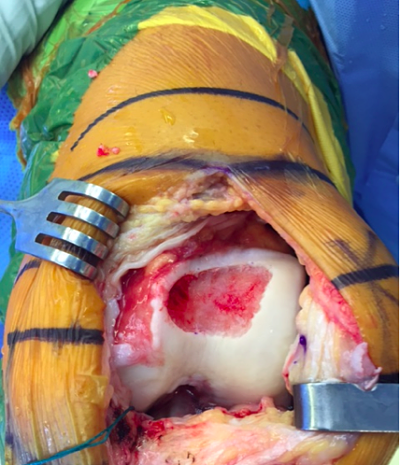 Articular cartilage defect of the medial femoral condyle after final preparation to stable vertical walls. Figure 6. 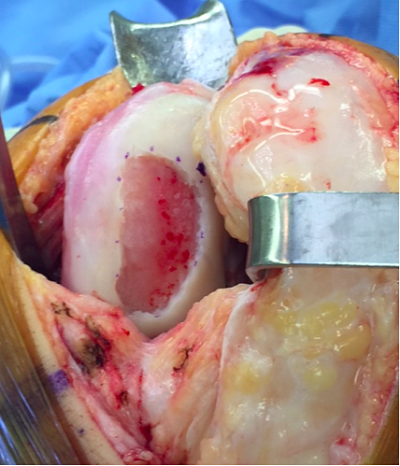 Articular cartilage defect of the femoral trochlea after final preparation to stable vertical walls. Figure 7. Final medial femoral condyle lesion appearance after completion of chondrocyte injection and patch reinforcement with fibrin glue. Figure 8. Final appearance of the femoral trochlea lesion after completion of the ACI procedure. Immediately following the procedure, place the patient in a hinged knee brace locked in extension for 24 hours to allow the implanted cells to adhere and remain underneath the patch. The patient should be made non-weight-bearing during this time period. After 24 hours, gentle range of motion (ROM) with a continuous passive motion (CPM) machine is initiated from 0° to 30°. CPM use is encouraged for roughly 6 hours per day for the first 6 weeks, with a 5° to 10° increase in range of motion daily. By 4 weeks, there should be at least 90° of flexion and 120° to 130° by week 6. Gentle passive ROM promotes diffusion and movement of synovial fluid around the knee, bringing nutrition to the site of cartilage repair. Transition the patient to partial weight-bearing from weeks 2 to 4, 1 crutch use from weeks 4 to 6, and progression to full weight-bearing from weeks 6 to 12. Initiate light jogging and sport-specific training between 6 to 9 months after the procedure, with full return to sports allowed anywhere from 9 to 18 months after the operation. At final follow-up 1 year after his surgery the patient was doing well, had returned to recreational football, and had no complaints of pain or swelling in his knee. Although the studies mentioned above were done in the general population, the results of ACI appear to be just as promising in athletes. In 2005, Mithoefer et al studied 45 professional soccer players with an average defect size of 5.7 cm2. After treatment with ACI, 83% of players in the study group were able to return to competitive soccer. A more recent study comparing ACI with microfracture, another common cartilage repair procedure, confirmed the durability and positive long-term results of ACI, even in athletes. Kon et al examined 41 professional soccer players, half treated with ACI and half treated with microfracture. Although both groups had similar results at 2-year follow-up, the ACI group had much more favorable outcome at 4- to 7-year follow-up. The microfracture group had a significant decline in performance. Although ACI presents an effective and promising technique for the treatment of articular cartilage defects, it does have several disadvantages, including the need for a staged procedure and a high cost. When ACI was first developed, periosteal hypertrophy was a common complication; close to 26% of patients required reoperation in the form of arthroscopy and debridement. With the adoption of collagen membrane patches instead of traditional periosteal patches, the rates of graft or patch hypertrophy have significantly declined. In addition, although ACI has shown promising results when used for defects in the patellofemoral joint, it is currently not FDA-approved for such use. 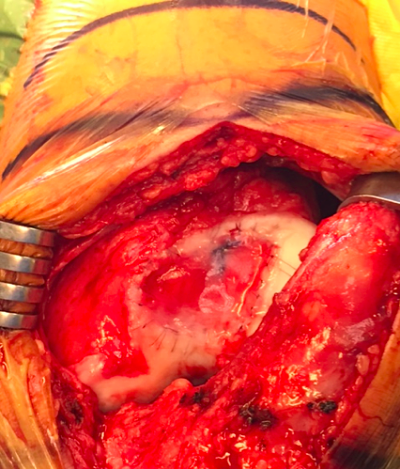 Any use of ACI in this location of the knee is considered “off-label” and may not be approved by insurance companies, leaving the patient with a significant out-of-pocket cost for the procedure. Lastly, articular cartilage defects that have a considerable amount of bone loss do not have as promising results with ACI. In those instances, alternative procedures such as osteochondral allograft – which can help fill in large bone defects – should be used. Patrick Kane, MD, and Kevin B Freedman, MD, MSCE, are from The Rothman Institute, Philadelphia, Pennsylvania. Hjelle K, Solheim E, Strand, Muri R, Brittberg M. Articular cartilage defects in 1,000 knee arthroscopies. Arthroscopy. 2002; 18(7):730-734. Nepple JJ, Wright RW, Matava MJ, Brophy RH. Full-thickness knee articular cartilage defects in national football league combine athletes undergoing magnetic resonance imaging: prevalence, location, and association with previous injury. Arthroscopy. 2012;28(6):798-806. Brittberg M, Lindahl A, Nilsson A, Ohlsson C, Isaksson O, Peterson L. Treatment of deep cartilage defects in the knee with autologous chondrocyte implantation. N Engl J Med. 1994;331:889-895.